Golden Habanero Peach Jam, Oh My! Peach goodness in a jar . . . .
We bought two cases of peaches from a truck that delivers to the local fire hall once a year, and have been enjoying the juiciest, most delicious Colorado peaches imaginable. 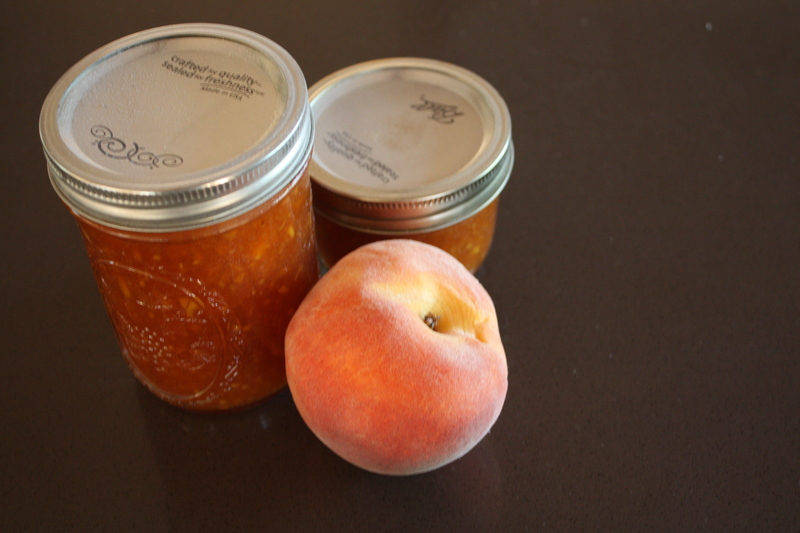 I have now used one case of “seconds” for peach jam and worked on a couple of recipes to arrive at a new combination. My first batch from a recipe I found online is wonderful, however with the addition of brown sugar, cinnamon and allspice, the jam is a dark amber color, closer to apple butter than peaches. I wanted to capture the beautiful golden color of the peaches and decided I needed to chop the fruit finer to have lots of little peach bits suspended in the jam. I used a potato masher on the first batch, and had to flip the jars for 24 hours to keep the larger bits of peach from rising to the top, leaving only juice jam in the lower half of the jar. This second batch was chopped much finer in my food processor and I revised the recipe with different spices and all-white sugar to arrive at the golden peach color I was seeking. I am pleased with the small peach bits suspended throughout the jar of jam. I reduce the sugar in jam recipes by 30-40% and have found the flavor is more “fruity” and less sugary, which is the way we like it. The addition of habanero peppers gives the jam a subtle flavor that warms the tongue with pleasant heat. Braise 1-inch pork chops on grill, place in glass baking dish and pour 1 cup peach jam over chops. Bake in 325 degree oven for 30 minutes – yum! Put chopped peaches, lemon juice, sugar, peppers and spices in large non-reactive pot. Bring to rolling boil, spooning off foam. Add pectin, stir vigorously and bring back to boil. Remove from heat, add vanilla and stir. Spoon into sterilized jars, leaving 1/4 inch head space, wipe rims and place lids. Process 10 minutes in boiling water bath, remove and cool on a towel for 12 hours. Enjoy! This entry was posted in Wecipes by bygeorge. Bookmark the permalink. Howdy Missy! Cleaning up older emails and this one popped up. Just yesterday I was in my pantry bedroom off the kitchen and found the jar of Holden Peach Habanero Peach Jam you gifted me earlier this month. Two nights ago I was a whirling dervish in the kitchen making both a blueberry and strawberry rhubarb pies and strawberry rhubarb jam – the SR pie is gone and the blueberry will be today when I gift big pieces to friends. The jam reduced to just enough for a small jar that I’ll keep in the fridge. Bought pectin but still need the other canning equipment. It will have to wait for another day when I’m near a thrift shop to snoop for a canning-type pot with insert. Looking at two WC houses today at noon and 1:30pm. Fall is definitely in the air. Temp got to 41 early this morning. Since the eclipse we’ve had much cooler days with late afternoon rains, big time. On Wed I retrieved three big plastic bins of camping stuff from a stall in the garage. Dang, those things are filthy from barn dust! Gave them a good cleaning with the hose and left them to dry outside. I’m slowly pulling stuff together for camping next Wed-Mon at the Pagosa music fest. Been buying good camping stuff whenever REI has a 20% off sale, happening now. Planning to finally buy a camp stove, though REI won’t mail it, gotta pick it up in CSprings. Ugh. Bought a new tent and luxurious padded cot last fall, used once this summer at the Great Sand Dunes. Returned one sleeping pad (too slippery) for another that’ll I’ll try next week. It sure takes lots of stuff to camp! Just packed up the tarp after washing it off. Still deciding where I’ll stay/go after Pagosa and before the Taos fest starts Sept 7. Have reservations for Abiquiu and Ojo Caliente, but likely switching some things, as I want to arrive in Taos Sept 6 – there will be a gallery walk with festival musicians playing at different venues. Times a wasting. Much to get off my ToDo list.